Sunday night coffee with my father and sister has turned into a weekly tradition. I love getting to spend time with my fam, I don't know where I would be without them! 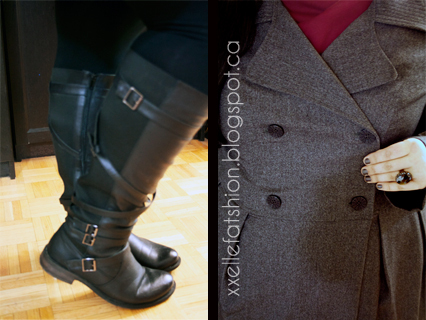 Here are a few snaps of what I wore last night. I know, I know, another eShakti piece (actually 2), but common, how could I resist?! 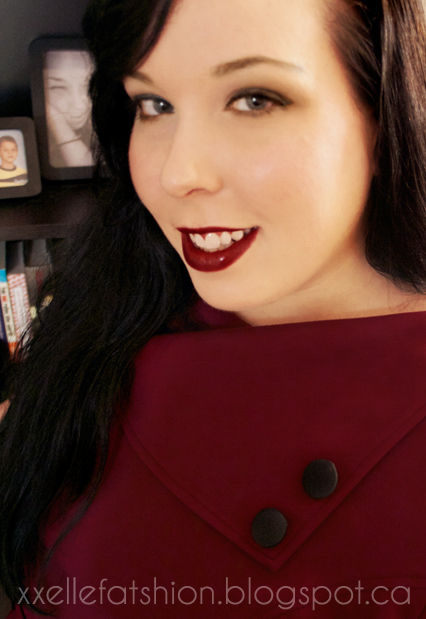 This super comfy dress (which is actually a bit deeper of a red than pictured) has quickly become a fave*, especially after I saw how cute it looked with my boots from Lane Bryant! It has pockets too! But seriously, what makes it so awesome is the vintage-esque neckline and the material. It's made of a ponte knit material which means that it has a good amount of stretch to it and is usually a tad thicker, making it great for the colder weather. This colour is sold out on the site right now (I believe they call it crimson on the site), but is still available in black and violet. If your heart is set on this colour, check back frequently, they are always updating their site with new stuff. I had it customized to have elbow length sleeves, and in hind-sight would have reduced the arm circumference, the shoulder and possibly even the under bust measurements by an inch because of the stretch in the material. This coat isn't available on the site at the moment, although there is a similar one in a cream colour. It's a fantastic jacket and is fairly light weight, which makes it perfect for fall/spring. 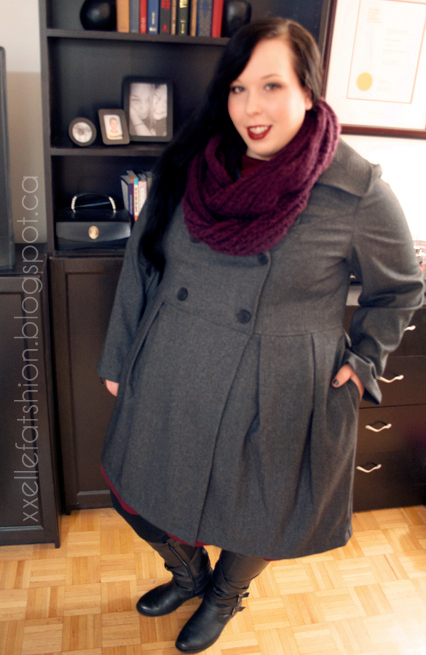 However, I had originally purchased it in hopes that it would work for winter, so you might see another coat review soon unless this beautiful, mild weather keeps up. These wide calf boots were originally purchased from Lane Bryant. By the looks of it they only have a 12 left on their site right now, but I have also seen them at Penningtons (they aren't showing on their website but I would def. check in-store). I purchased these in a size 11 to be safe and thankfully it paid off because they fit like a glove. My calf is 19" and as you can see the straps don't really interfere. The back of the boot is almost entirely made of elastic band. I've read a few reviews and heard feedback from others that the sizing was really varied, I guess I just lucked out. Also notable, a friend of mine with 21" calves said that they didn't fit her, so just a heads up. A special thanks to everyone for your warm wishes and words of encouragement with my blogiversary, it really means a lot to have so much support from such a wonderful community. A few of you have been emailing me with questions or for advice, so just an FYI to everyone, if you ever have any questions please feel free to email me at xxellefatshionblog@gmail.com or leave a comment and I will get back to you as soon as possible. If you don't hear from me within a day or two, please try me again, my spam filter is evil! * I have been receiving my pieces from eShakti via referral credits, my reviews are my honest opinion. that dress is such a dream!! In fact, I think I might go buy it after I make this post. That colour is just breathtaking on you! !